Great sculpture needs to breathe. For more than fifty years, The Storm King Art Center has been showing modernist sculpture in the breathtaking landscape of the lower Hudson Valley. The nonprofit, founded and opened to the public in 1960 through the efforts of the late Ralph E. Ogden and H. Peter Stern, transformed the farmland of a country estate into a foremost site for examining the relationship between natural and man-made form. Mark di Suvero Pyramidian, 1987/1998 and Beethoven’s Quartet, 2003. Photograph by Jerry L. Thompson. The seasonal center in Cornwall, New York, near West Point, Bear Mountain, and across the river from Beacon, is a little over an hour drive north of New York City. The trip is best appreciated by heading up the riverfront roads on the picturesque western side of the Hudson. Directions and bus schedules are available here. As the long-time director David Collins explained to me, the inspiration for much of what appears at Storm King came from Terminal Iron Works at Bolton Landing, the rural New York studio where the sculptor David Smith often kept his work outside like crops in the fields. Many of these sculptures became early aquisions for the Center. Mark di Suvero Jambalaya, 2002-06. Photograph by Jerry L. Thompson. In part thanks to commissions by Storm King, some of the most iconic works of the sculptor Mark di Suvero are now centerpieces here. Mark di Suvero Frog Legs, 2002, Mozart’s Birthday, 1989, Neruda’s Gate, 2005. Photograph by Jerry L. Thompson. Alexander Liberman Iliad, 1974-76. Photograph by Jerry L. Thompson. The outdoor environment, and curatorial taste, has limited the range of sculpture in the Storm King collection, which is heavy on metal abstraction of the second half of the twentieth century. Some can seem overwrought and stuck in the 1970s. 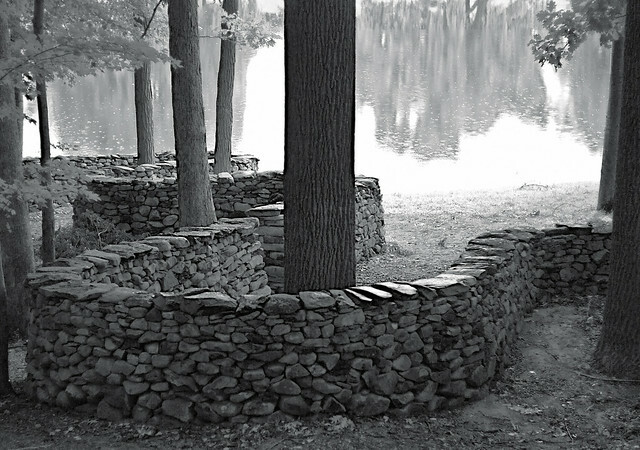 But in recent years the Center has seen sculptors take on the landscape in new ways, such as Maya Lin's Wavefield, and, a favorite, the snaking stone walls of Andy Goldsworthy. To me a foray into contemporary Chinese art with work by the theatrical Zhang Huan (who is also the focus of this summer's exhibition) seems like a misstep. You can read more of my thoughts on Zhang here. To its credit, this artist's large Three Legged Buddha, with its incense-burning toes stomping a head into the ground, conveys a palpable sense of corporeal discomfort. Sculpture safari! Calder spotted on the ridge. What would I like to see next at Storm King? An increased engagement with the range of artists taking a new look at form and nature, from Giuseppe Penone to Rachel Beach. A "Storm King biennial" would serve as further reminder that there's more to contemporary sculpture than Koons, Koons, Koons.